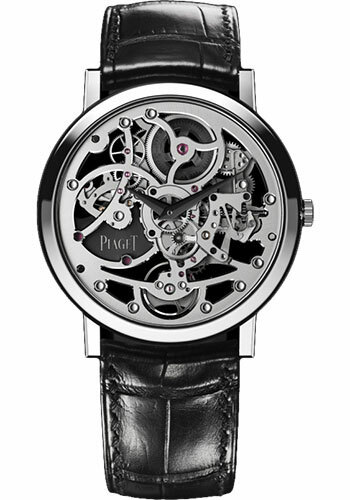 38 mm 18K white gold skeleton case, 5.34 mm thick, sapphire skeleton back, silvered dial, 1200S automatic movement, approximately 44 hours of power reserve, black alligator strap, ardillon buckle. Water resistant to 03 ATM. 38 mm 18K rose gold skeleton case, 5.34 mm thick, sapphire skeleton back, silvered dial, 1200S automatic movement, approximately 44 hours of power reserve, grey alligator strap, ardillon buckle. Water resistant to 03 ATM.